American Airlines Federal Credit Union, Fort Worth, Texas, awarded six $5,000 scholarships to five high school students and one college student. 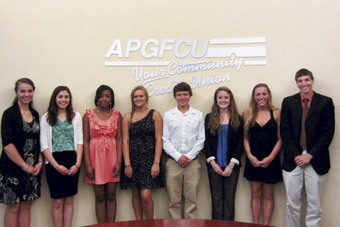 The 2012 AA Credit Union Scholarship recipients were chosen from 247 applicants, all young members from across the country. Two selection committees composed of credit union staff members reviewed applications consisting of essays and listings of academic and extracurricular achievements. The recipients of the 2012 AA Credit Union Scholarships were James Blonde, who will be attending Notre Dame and is pursuing a career in engineering; Matthew Ferguson, who will be attending Cornell University, where he plans to major in chemical engineering; Brent Hannema, who will be attending Loyola University Maryland and plans for a career in accounting; Kyle Neustrom, who will be attending Creighton University and aspires to a medical career; Shannon Sullivan, who will be attending the University of Texas at Austin and plans to pursue a career in the physical sciences; and Kendy Real, who will enter the Respiratory Care Program at Stony Brook University.